I'll admit I didn't properly seal myself in the bubble. But it's because I thought it was safe considering the past few days of Better Take a Jacket weather, one mosquito just whizzed past me in bed. The first couple of days were spent in intense lounge mode. I'm not sure why I felt like I could afford it considering the looming and ever increasing to do list. But movies beckoned. I even at one point felt the luxury of allowing myself to be bored. I saw Ocean's 12 which was awesome, Spider which was freaky, Shrek, a classis, always a winner, Hitch which was fun and What the Bleep Do We Know which was sort of thought provoking. But thinking went against my mood so it didn't last long. The next few days were (are) spent in a mad frenzy not only because I had to make up for lost time but because I kept taking on more tasks. But frankly, I'm afraid of jinxing the outcome, so I won't talk about it until the Big Project is done. And then of course there is the mounting excitement and overflow of emotion because of the upcoming visit to California. Oh, and, by the way, the park is filled with reds and yellows. I wanted to try something different from I normally use saffron in. Well, by normally, I mean quite infrequently since it’s not oftern enough I make paella. So I poked around on the internet with two thoughts in mind: 1) use the saffron I received from Christina in a recipe and 2) not have to leave the house to buy more ingredients. The later was indeed a real challenge since the cupboards and fridge were pretty sparse due to the upcoming trip to California. I came across this website. It focuses on the cuisine of Iran. I altered the recipe in only one, yet conceivable important way: I used pork (I know I know !) instead of ground beef. So not only have a made the dish inedible to Irani Muslims, the dish was missing a key juiciness that had I used ground beef would have solved. 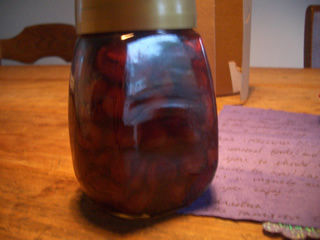 Other than it’s nice color, which could have actually been from the tomato paste, the saffron was not noticeable. Back to the cutting board. 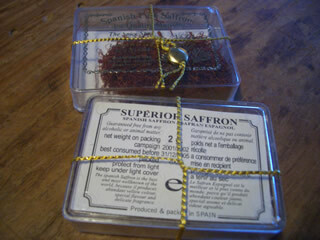 anyone with better suggestions for using saffron, I am all ears. 2. String the beans, wash and chop into 1 inch lengths. 3. Slice the onion and fry in a little oil until it turns golden brown. Add the meat and continue to cook until the meat is half done. Add the beans and continue to cook over low heat until all cooked. Add tomato paste, 2 tbs lime juice and 1/4 tsp saffron, salt and pepper and remove from heat after a couple more minutes. Make sure you don't overcook the mixture. 4. In a large saucepan, bring 8 to 12 cups of water to a rapid boil. 5. Pour off excess water from rice and pour into boiling water. Bring back to boil for 2 to 3 minutes. Test to see if the rice is ready. The grains should be firm in the center and rather soft on the outside. Strain and rinse with lukewarm water. Toss gently in the colander. 6. Bring 1/4 cup water and 2 to 3 tbs oil to rapid boil. Add layers of rice and the mixture of beans and meat interchangeably building it up to a conical shape. 7. Poke 5 or 6 holes through the rice to the bottom with the handle of a spoon. Close the lid. Keep on medium-high heat for 2 to 3 minutes until rice is steaming. 8. Heat up 1/4 cup of water and 2 tbs oil and pour over the rice. Wrap the saucepan lid in a clean tablecloth and cover the pan firmly. Reduce heat to low for 45 minutes to an hour. 9. After removing from heat, place the saucepan in the sink and run cold water under it to cool down. 10. Add 1/4 tsp saffron to 1 tbs hot water. Lightly mix 2 to 3 tbs of rice with the liquid saffron in a small bowl. Set it aside for garnish. 11. To dish up, gently toss the rice and sprinkle lightly in a dish in a symmetrical mound. Garnish with the saffron rice. 12. Remove the crusty bottom and serve in a separate plate. The early morning buzzing was initially an unwelcome noise considering the extreme drunkenness I endured through the night until it occurred to me that it might be the postman and that Alec was still home so that he could deal with the door. The delivery had to be either a new modem or my much anticipated food parcel. I was thrilled it was the food parcel since the thought of setting up a new modem is too much to bare. 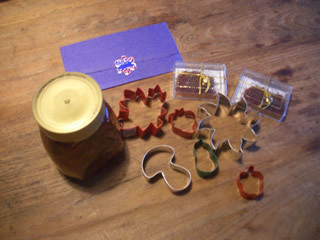 The packages included several cookie cutters, two packages of saffron - the cupboard item I will incorporate into several menu items this week, and a pot of cherries which have been sinfully soaking in brandy since last year - the fruity item. I'd like to thank Christina for the delights and to let you know that her website seems chock full of good looking ideas. Also, to Andrew thank you for organizing this meeting among people who care about food. I hope to participate in another exchange soon. No matter what tone of voice I used, using "crap" in any sentence didn't sound good. It's use immediately made me feel terrible. Where does this negativity come from? Why can't I be nice? How can someone as sensitive as I am be so insensitive to others? I say it unintentionally. I said the first thing that came to my mind when in fact, what was on my mind was something else. I wanted to be apologetic this morning, to be nice and to be appreciative. I wasn't refereeing to crap. In fact I was talking about something beautiful. I used the word to describe something beautiful to my parents! people who care, to people who would take it personally and make their heart sink a bit to hear it. I'm afraid it made my earlier apologies less sincere. A few weeks ago my mother-in-law asked me if I had picked out a china pattern. A perfectly sensible question to someone who just got married. The question nonetheless struck me as a bit funny since while I guess I always wanted a china pattern, it never occurred to me to pick one out. I guess you can't take the girl out of Santa Cruz completely. A few months before, my parents splurged on a complete new service for 8 for me. I couldn't even really believe it. I guess I do have a chine pattern! On their weekend visit, they brought half of it with them and it is truly beautiful. A meal is more complete when all the details are looked after. Presentation matters. What's more, and I didn't notice it until seeing it live, it's the shade of yellow which I love yet feel I cannot wear. The service made for a very festive holiday table. Despite what I said (in a continuing effort to prove once again what a brat I am, to be discussed further): "Thanks for bringing me all this crap", I am very lucky to have it and very much look forward to getting to use it again. If I may recover myself and relive those moments again I would much rather say this: thank you very much mom and dad for buying this for me, for knowing what I like, for carrying these heavy piece across the Atlantic, and most importantly for loving me despite my faults.